AMEN Corner: How Long Should A Sermon Be? On an Easter Sunday we had 58 people at the 9:30 service and 21 people in the 11:30 service. Attributable to the grace of God and not to my own abilities, all 79 of those were able to stay awake during the sermon! I admit to being completely incompetent when it comes to judging the level of interest in my sermons. On many occasions, I have labored long and hard over what I believed to be a brilliantly-crafted sermon with spot-on exegesis of the biblical text, animating illustrations and a surefire, come-to-Jesus, life-changing application guaranteed to bring people to their knees in repentance and change their lives. Then on that Sunday morning, as I watch eyes close and chins sink slowly to chests, I am once again delighted to be able to facilitate the congregation’s much needed rest. 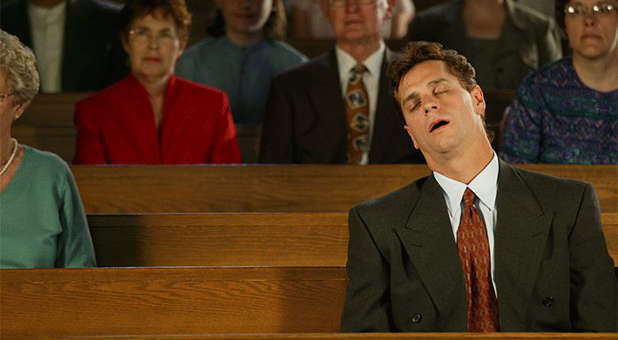 On just as many occasions, I can knock out a sermon that has me bored as I write it and embarrassed to deliver it only to do so and see an alert and interested congregation with smiling faces, heads nodding in agreement and people taking notes. Not only that, but after listening to thousands of sermons and delivering over 600 of my own, I still have no idea of what the perfect length of a sermon should be. According to the Vatican, a sermon (Catholics call it a homily) should be a maximum of eight minutes and a seven minute sermon is the ideal. Their “8 Minute Rule” is based on the amount of time they say that the average person can concentrate and they believe that any homily over fifteen minutes is “liturgical abuse.” It’s different in the Protestant non-liturgical church. In the days of the Puritans, sermon length was close to two hours, but today the longest sermons are in the range of an hour or more and are preached in the Baptist and Pentecostal churches. Is it true that our attention span is only eight minutes long? Only if you’re bored. Consider that American adults spend an average of 5.5 hours per day glued to their television. Many senior adults spend an average of three hours a day on social media. Then on Sunday, people get restless after a 15 minute sermon and can’t wait to get outside to enjoy an hour of hospitality and fellowship time. They then go home and watch a three hour football game or a four hour golf tournament on television. The interest level in worldly things is often determined by their entertainment value and many church-goers today expect to be entertained by their church. An on-line newsletter for pastors reported last week that many who are shopping for a church say they are looking for positive, humorous, “feel-good” messages by a charismatic pastor. But a sermon is not meant to entertain us–it’s to change us. The sermon should take the relevant Word of God and apply it to our lives in a manner that is transforming. Jesus said that the job of the church is to save souls and change lives. Matthew 28:19 It is through the grace of God and the preached Word of God that we do that and while you should find a “gem” in every sermon, not every sermon is about you. One Sunday you may hear a sermon that penetrates your heart and scores a direct hit and the next Sunday you may be bored to tears by a sermon that’s the life-changing message for someone else. How long should a sermon be? The longest described sermon in the Bible was given by Paul who preached all night and bored a person to the point that he fell asleep and tumbled out an open window to his death. Acts 20:7-9 The longest sermon given by Jesus was the “Sermon on the Mount” Matthew 5:1-7:29 that is 2,551 words and would have taken Him about 20-25 minutes to deliver. Interestingly enough, in polls taken today, the majority of Protestant church-goers say that 20-25 minutes is the ideal sermon length, but the average length of a sermon in a Protestant church is 30-45 minutes. Pastor and Christian author, Tony Campolo, tells of one time when he was speaking at a black church. He was rambling on and on to the point that a woman stood up in the back, waved a white handkerchief in surrender and began shouting, “Help him, Lord Jesus! Help him, Jesus!” Today my sermons are no more than 20-25 minutes, but back in my Pentecostal days I too could go on for over an hour. Thank God the windows were not able to be opened.